Whether you plan on creating a podcast/newscast, recording music, or entertaining an evening of karaoke at home, a dependable microphone plays a crucial role. Although most microphones stick to a familiar form – it’s like handling a flashlight, except that the business end records audio instead of illuminates – you can find ones exhibiting a little more creativity with different shapes and sizes. And as with many other types of modern technology, microphones can showcase a variety of specialties and useful features. Microphones are sold across a wide range of prices. Affordable models can be had for less than $50, while the expensive ones can add up to the thousands of dollars. Despite there being a lot to choose from, almost every single microphone will fall into one of two basic types: dynamic and condenser. The other, less common kind you can encounter is the ribbon microphone. Although each is a transducer that performs the similar duty of picking up and capturing sound, the methods of creating electronic output signals are quite distinct. Depending on the particular recording needs/situations, one may be the better option over the other. The thing is, it's terribly difficult to tell the different types apart just by looking at them. , but in reverse. So with a traditional speaker, the audio signal travels from the source all the way to the voice coil, which is attached to a cone (also known as a diaphragm). When electricity (the audio signal) reaches the coil, a magnetic field is created (electromagnet principle), which then interacts with the permanent magnet located right behind the coil. The fluctuation of energy causes the magnetic fields to attract and repel, forcing the attached cone to vibrate back and forth, which is what produces the sound waves that we can hear. As with traditional speakers, dynamic microphones are excellent at handling high volumes with tried and true technology. Not only are dynamic microphones typically less expensive to manufacture, but the electronic insides tend to be more rugged than their condenser counterparts. This means they can take a hit and handle a drop – ideal for actively holding in hands versus leaving it mounted on a fixed stand. Keep in mind that overall durability comes through quality construction; just because a microphone is a dynamic doesn’t guarantee it’s built to last, let alone outlast a condenser microphone. Dynamic microphones aren’t as sensitive – for the most part​ since there are some expensive models that can deliver incredible results – as condenser microphones. This is largely due to the weight of the magnets and coil, which inhibits how quickly the cone can respond to sound waves. While certainly a drawback, depending, it’s not always a bad thing. Lower sensitivity and a more limited high-frequency response generally means less detail captured in recordings, but that also includes ambient/unwanted sounds. You can relate the operation of condenser microphones to that of an electrostatic speaker but in reverse. With an electrostatic speaker, a thin diaphragm is suspended between two grids (also known as stators), which are connected to a voltage supply. The diaphragm is constructed with electrically-conductive materials so that it can hold a fixed charge and interact with the grids. Audio signals of proportional strength but opposite polarity are sent to each grid; if one grid is pushing the diaphragm, the other grid is pulling with equal strength. As the grids fluctuate from the changes in voltage, the diaphragm moves back and forth, which results in creating the sound waves we can hear. Unlike dynamic microphones, condensers don’t have any magnets. As with electrostatic speakers, major benefits of condenser microphones are enhanced sensitivity and response. By design, the thin diaphragm is capable of quickly reacting to faint and/or distant pressures of traveling sound waves. This is a reason why condenser microphones are exceptionally accurate and adept at capturing subtleties with crisp clarity, which makes them ideal for high-fidelity recordings – particularly ones involving vocals and/or higher frequency ranges. 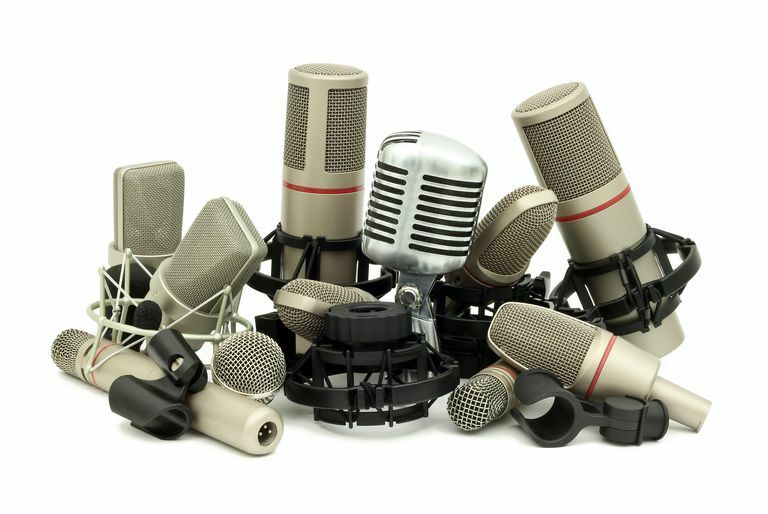 And because of how the electronics are designed to work, condenser microphones can be found in a wider variety of shapes and sizes than dynamic microphones. Although enhanced sensitivity may seem fantastic, there are some drawbacks. Condenser microphones are subject to distortion, such as when attempting to record very loud instruments or sounds. They are also more susceptible to audio feedback – this happens when sound received by the microphone passes through a speaker and gets picked up again by the microphone in a continuous loop. They can also pick up on unwanted noise, particularly if you’re not in a very quiet or sound-proofed room. For example, a condenser microphone may not be the best to use for an outdoor interview/recording when there is wind, rain, or city/nature/people sounds in the background. Although such noises can be removed with software for editing music and sound recordings, it does require that extra step. Microphones also have a varying dynamic range of frequency response (check the manufacturer’s specifications), which can make one type better than another, depending on how they are meant to be used. Some are also designed to treat recordings naturally/neutrally, while others add enhancement – this can be in the form of coloration and/or the perceived size of sound – to the overall imaging. Other specifications to compare and consider are signal-to-noise ratio, maximum sound pressure level (input sound), total harmonic distortion, polar pattern, and sensitivity. In the end, the right microphone will be the one that sounds best to your ears while meeting your needs for use.